Define the innovative design strategies employed in projects drawn from several Architectural Record's Stadiums Building Type Studies and project overviews. Explain how a collaborative design approach can be strategically used in stadium design. Discuss how the design teams created optimal environments to appeal to the sports fans frequenting these stadiums. Describe the range of design approaches and materials employed on a variety of stadium projects. This course will look at a number of Architectural Record Stadiums Building Type Studies and project stories from across the United States, with a focus on collaborative design approaches, fan appeal, and green practices. 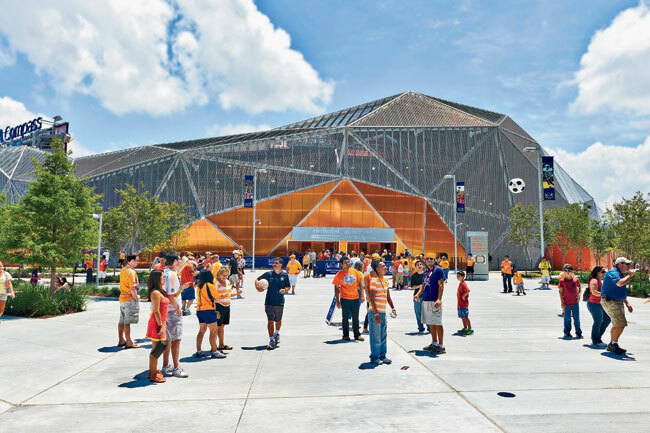 Muscular Mesh: Populous’s new BBVA Compass Stadium for Houston’s soccer team vividly conveys energy and dash. The Barclays Center in Brooklyn is getting a green roof, to be completed this fall.